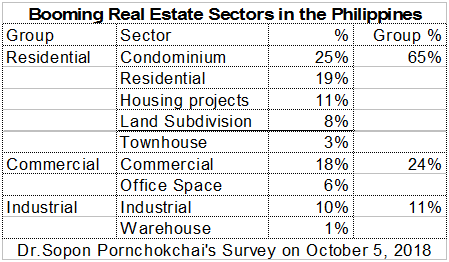 This is a result of a questionnaire survey of 200 respondents who were PAREB members who are property professional and should be able to represent real estate industries in the Philippines on the economy and real estate, booming sectors of developments, salient property developers as well as their view on the credibility of brokers and valuers in the Philippines. PAREB is one of the largest organizations of real estate brokers and valuers in the Philippines. Its 7,000 members would represent views of real estate professionals in the Philippines. In the convention, some 1,200 members attended. However, this survey of 200 questionnaires should be adequate for the analysis. In terms of economy, in 2018, it was assessed at 6.8 out of 10. This implies that the economy of the Philippines is fine. In addition, it was assessed at 7.4 in 2019. Philippines' real estate professionals thought that the economy of the Philippines would get even better in 2019. This might be a good sign for investment in this country. The residential sector is the most attractive sector assessed by the professionals. In particular, the residential condominium markets seemed to be very much growing. This might be due to the fact that traffic in Manila is very problematic. People needs to stay closer to the city. Perhaps, the growth might be due to speculation as well. Ayala was voted to be the best performing developers in the Philippines by valuers and brokers under PAREB at 32% The SMDC was the second (20%) and the DMCI was the third (16%). The Megaworld was the ranked at the fifth with 10%. Other highly recognized firms were Vista Land, Robinsons Land, Camella, Filinvest Land, Rockwell and the like. If the respondents could buy property abroad, where should they buy? There are a diversity of destinations. The largest proportion of the respondents would like to buy real estate in USA (22.6%). 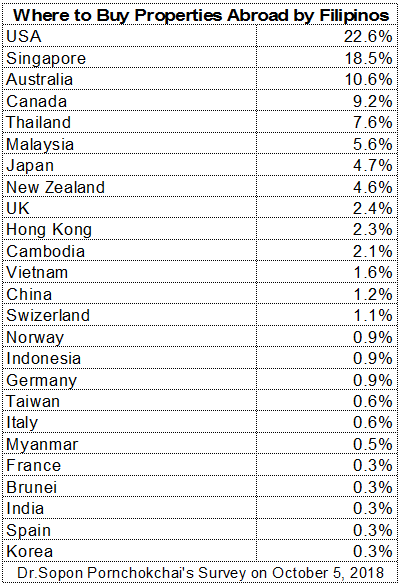 Singapore was the second 18.5% Australia was the third at 10.6% followed by Canada 9.2% and Thailand 7.6%. However, there are actually a lot of obstacle. Singapore might merely be a dream because it imposed a very high tax at 20% for foreigners. Malaysia also has a minimum price of properties to buy, namely, 2 million ringgit (USD 481,928). Foreigners can buy only of-the-plan housing projects in Australia (not existing homes). In addition, a crucial question was asked if the credibility of a medical doctor is 10 (which is the best), what the respondents ranked for brokers and valuers. It was found that brokers got 8.2 out of 10; whereas, it was 7.8 in the case of valuers. Perhaps, in this PAREB, brokers have strong confident on their profession. This implies a good control of the professional in the Philippines. In sum, both economy of the Philippines and its real estate markets are fine and would even be better next year. The residential sector is the most attractive sector assessed by the professionals particularly condominiums. 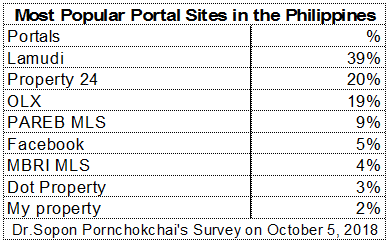 Lamudi is the most powerful portal in the Philippines followed by Property 24 and OLX. 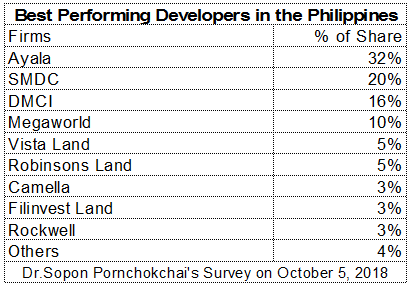 Ayala was voted to be the best performing developers in the Philippines followed by the SMDC and the DMCI. There are a diversity of destinations for those who would like to buy properties abroad; however, USA was the first in the priority followed by Singapore and Australia. Broker profession was strongly recognized by the participants. Dr.Sopon would like to acknowledge and thank Mr.Rey Cartojano, President, the Philippines Association of Real Estate Board (PAREB) for helping read the draft of this report.